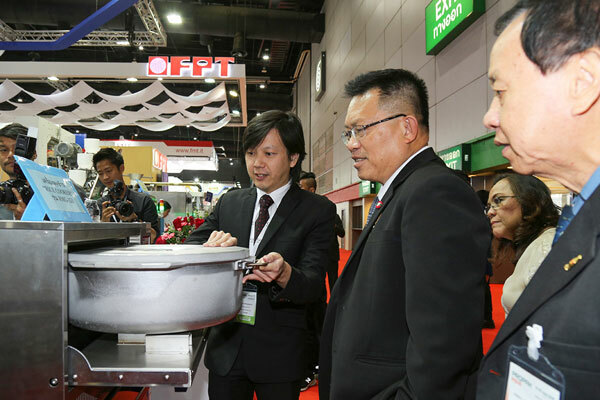 Bangkok — ProPak Asia 2018, once again, returns bigger than ever for its 26th successful installment as the leading trade show of its kind for Asia’s rapidly expanding processing and packaging industries. This year sees the addition of a 9th hall, increasing the total exhibition area to more than 58,000 sq m — a 10% increase from 2017 — which means even more suppliers will showcase their latest innovations, machinery and industry solutions to an expected record number of over 50,000 attendees. ProPak Asia 2018 features more than 5,000 advanced machinery solutions for all business sizes, from large enterprises to SMEs and startups. 1,600 exhibitors from 45 countries, and 18 international pavilions from the following 13 countries: Australia, China, Denmark, France, Germany, Italy, Japan, Korea, Singapore, Spain, Taiwan, UK, and USA will showcase the very best and latest processing and packaging technologies across 9 industry zones including; ProcessingTechAsia, PackagingTechAsia, DrinkTechAsia, PharmaTechAsia, Lab&TestAsia, MaterialsAsia, Coding,Marking&LabellingAsia, Coldchain,Logistics& WarehousingAsia and Printech Asia. Boosting manufacturing capabilities and production variety and efficiency across Asia. “Thailand 4.0, the development of the Eastern Economic Corridor (EEC), and expanding GDP and exports are driving increased manufacturing demands for more supply, higher value, and greater variety. This is an ideal moment for manufacturers and businesses to increase and adopt new technology and automation techniques to boost their capabilities and production efficiency. ProPak Asia is the industry’s leading sourcing event to find new ideas and solutions and drive greater future success for our economy.” Said H.E. Dr. Somchai Harnhiran, Deputy Minister of Industry. range of machines, new technology and packaging solutions for processing and packaging businesses of all sizes ranging from industrial to SME’s. Visitor pre-registration is up 15% y-o-y with more overseas buyer delegations attending than ever before from countries including; Bangladesh, Cambodia, India, Indonesia, Laos, Malaysia, Myanmar, Philippines, Singapore, Sri Lanka and Vietnam. “ProPak Asia is the industry’s annual meeting point in Asia. It presents the biggest and widest range of machines, new technology and solutions directly to Asia in Asia. Buyers look forward to ProPak Asia every year, and this year once again ProPak Asia presents it’s Biggest-Ever event with more machines, new events and more buyers. ProPak Asia really is the home of innovation in Asia.”Said Mr. Justin Pau, General Manager of UBM Asia (Thailand) Co., Ltd. In addition to the huge exhibition, ProPak Asia 2018 features new conferences including; ‘Active & Intelligent Packaging Industry Association (AIPIA) Conference: Active & Intelligent Packaging Technologies for Smart Printing & Packaging for the Digital Age’, ‘Australian Institute of Packaging (AIP) Training Course: The Role of Packaging in Minimising Food Waste’, and ‘Food Industry Asia (FIA) Conference: Sustainable Packaging: Tackling plastic waste in Southeast Asia’. Together with leading events including; Food Innovation Asia Conference 2018, Food Innovation Contest 2018, Asia Drink Conference 2018, PharmaTech Seminar 2018, TISTR Conference 2018, The Department of Industrial Promotion Seminar 2018, The FoSTAT-Nestle Bowl Quiz, Food Focus Thailand Seminar 2018, ThaiStar - AsiaStar - WorldStar 2018 Awards Ceremony, SME focused workshops and packaging seminars, and many more. ProPak Asia 2018 is a must-attend for anyone involved in the processing and packaging industries. The event provides a platform for new business, expanding professional networks and obtaining the latest industry information from a wealth of world class suppliers and exciting conferences. ProPak Asia 2018 will be held from 13-16 June, Halls 98 to 106 at BITEC, Bangkok, Thailand. Opening hours are 10am to 6pm every day. About UBM AsiaProPak Asia is organised by UBM Asia-Asia’s Largest Trade Show Organiser–and a division of UBM plc. UBM is the largest pure-play B2B Events organiser in the world. Our 3,750+ people, based in more than 20 countries, serve more than 50 different sectors. Our deep knowledge and passion for these sectors allow us to create valuable experiences which enable our customers to succeed. Please visit www.ubm.comfor the latest news and information about UBM.